Everywhere we look, we see young girls who feel like they don't measure up. They are told to look, act, speak, and be a certain way. When they don't, they are made to feel less than. So girls either shrink back and hide who they are or strive to be something they are not. 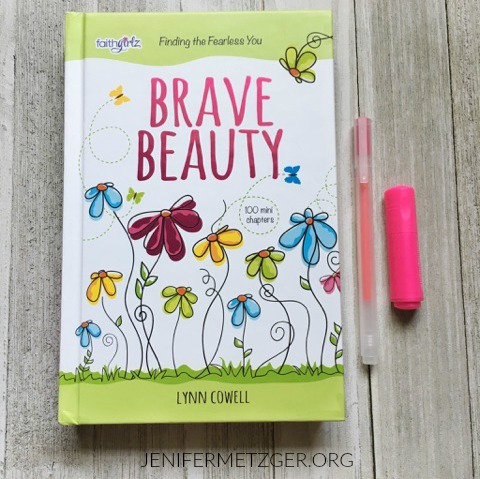 In her new book, Brave Beauty, Lynn Cowell wants to reach young girls and teach them to find confidence in God. Lynn, having raised 3 teens, has a passion to reach out and show teens how to live for God and be brave for Him. Lynn put together 100 mini devotions as a way for teen girls to learn how to grow their relationship with God and be who He says they are. Brave Beauty includes questions like, "What's ahead?" "Where do I fit in?" and "What am I good at?" Girls will talk about and answer these questions that are already circulating in their minds and will be able to use this is an incredible source to help reinforce the positive promises of God's active work and place in their lives! Whether your girl is 10 and just entering this world, or 18 and making her way into adulthood, this book is for her. To enter to win Brave Beauty, complete each task in the rafflecopter below. Thank you so much for sharing, Jenifer! She's at an age where she's beginning to develop her character and I want to help equip her and teach her a about all that God created her to be. Thanks for this article. I would love to read this good with my daughter. My 11 year old daughter is a Jesus lover, a prayer warrior for her friends and has a heart of gold. But since she has started middle school, at times, she does struggle with being Brave and doubts herself. I want her to keep that same joyful, kind, positive spirit and I'm praying she is able to keep her feet, identity and faith firmly planted in Jesus throughout the years to come, no matter what situations or change she may face. I believe this book will help her do so. Thank you for chance to win! My 11 year old is a Jesus lover, prayer warrior for her friends and has a heart of gold. Since she has started middle school, at times, she does struggle with being Brave and doubting herself. She has a joyful, kind, positive spirit and I'm praying she keeps her feet, identity and beautiful faith firmly planted in Jesus, no matter what challenges or change she may face throughout the years. I believe this book will help her to do so. Thanks for the chance to win! This stage of life for an adolescent girl is very challenging, especially to focus on God's word and the path they should take. Both my daughters would greatly benefit from this book! My two oldest struggle a lot, my #3 struggles some and the 5 year old is very confident that she's the best thing ever.